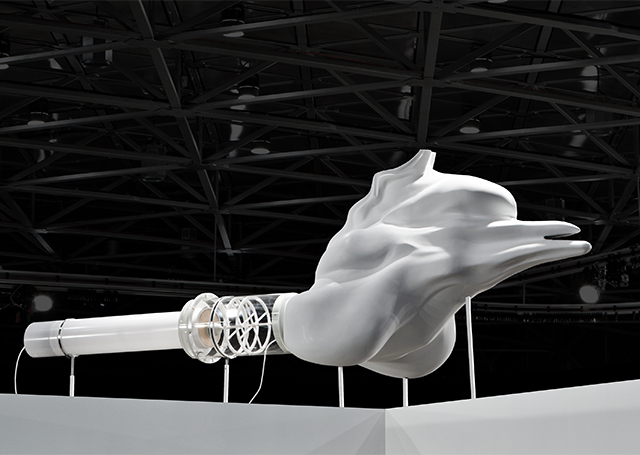 Marguerite Humeau is presenting solo exhibition FOXP2 at Nottingham Contemporary opening on October 15 and running to January 15. 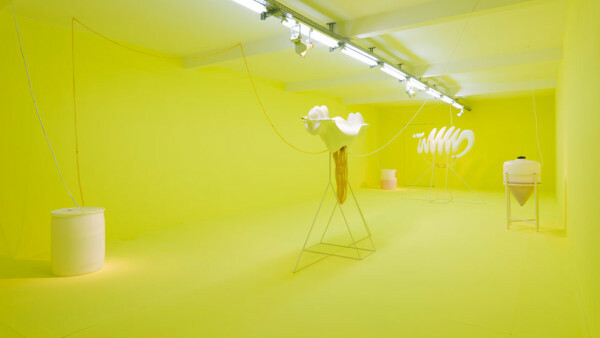 The event, co-curated by Rebecca Lamarche-Vadel and Sam Thorne, is a collaboration between Nottingham Contemporary and Paris’ Palais de Tokyo where it has already opened in June of this year. 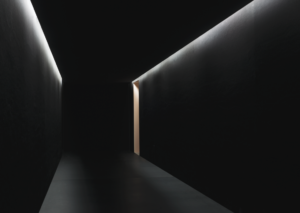 The multi-sensory exhibition explores space and time through a choir of 108 billion voices, immersing us in an installation that embarks on a journey back to the origins of life and towards the vision of a human-less future. 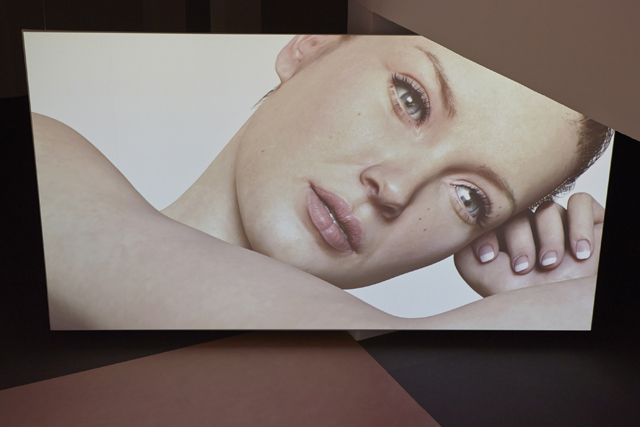 There’s nothing that can prepare you for walking into a Marguerite Humeau exhibition alone, with no one else’s sanity to cling to. You might think you’ve lost your mind—you might think you’ve found something better. Walk into one of her exhibitions on a grey, godless Berlin afternoon suspended in the middle of a unrelenting winter and you might think you’ve seen god. 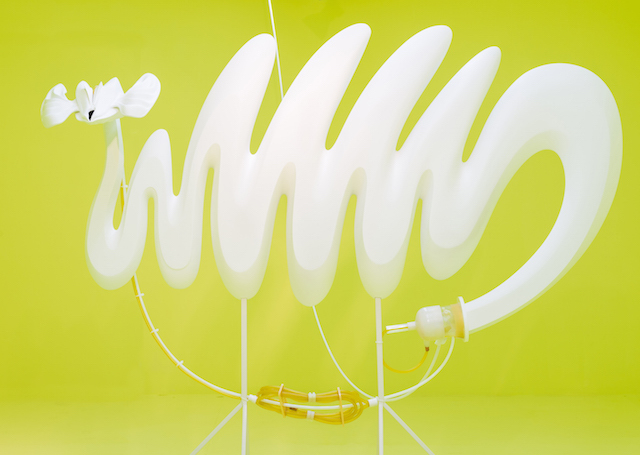 For all intensive purposes, Humeau acts a bit of a god—or a bit of the mad scientist. She communicates with aliens, she brings prehistoric creatures back to life, she summons from the middle earth the sounds of hell. What she’s really doing, she says in an interview carried out on video chat, is trying to bridge great distances in time and space; bringing disparate and and farfetched worlds together under one roof. What she’s really doing, I say, is creating an ode to imagination. Having come of a design degree at the Royal College of Art, Horizons at Berlin’s Import Projects was one of Humeau’s first solo shows, a fact you would never know looking at the extraordinary exhibition. I was there and wrote about it before, but words didn’t capture the awe I felt, just as Humeau’s words in her lengthy and extensively researched accompanying story didn’t capture the sophistication of the design, the sonic and visual architecture of the resulting exhibition. After months of chasing our own busy tails, Humeau and I finally connect to talk aliens and ghosts, the self-imprisonment of the “post-digital generation”, and what there is left for us in the lost world. I was lucky enough to see Horizons alone on a rainy afternoon. It felt like I had entered a door off Kurfürstendamm and into another dimension—a whole different auditory, visual universe. What was the inspiration or point of origin behind the show? 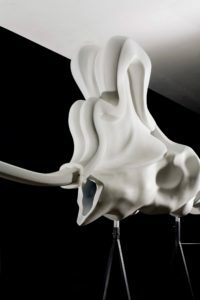 Marguerite Humeau: Actually, when Nadim Samman contacted me for the show at Import Projects, we went through the different projects that I had been doing in the last couple of years. I graduated four years ago from the Royal College of Art and one of the projects that was part of the show at Import Projects was The Opera of Prehistoric Creatures, which started as my graduation project (with ‘Mammoth Imperator’ and ‘Lucy’) and then evolved into a full opera with two more creatures (‘Terminator Pig’ and ‘Walking Whale’). So we talked about this project, and at the time I was also working on The Things?, a project whose quest was to communicate with alien creatures. In 2012, creatures (such as Albino Hairy Crabs, Dumbo Octopus, Pompeii Worms) were found in Antarctica at the bottom of the ocean, in volcanoes near the East Scotia Ridge. It was really incredible for the explorers to find these creatures living there because they were forms of life that didn’t rely either on oxygen nor on sunlight, but their source of energy was actually coming from the volcanoes themselves, from the sulphur that was transformed by bacteria into nutrients that the creatures can then absorb and use as food. I was reading about this discovery, and then I found out that this place in Antarctica is actually the closest equivalent to one of Jupiter’s moons, Europa. So scientists think that finding life in Antarctica, in this exact spot, could potentially mean that life is possible on Europa. So I wanted to try to communicate with these creatures in Antarctica, and by extrapolation to the aliens of Europa, as the creatures of Antarctica could potentially be exactly the same on this extraterrestrial planet. 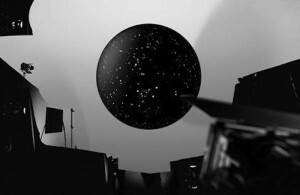 ‘Mysterious Crash’, extract from director’s cut (2013). Image courtesy Marguerite Humeau & Le Studio Humain. So that’s what I was working on when I talked to Nadim. What we thought was the core of my research and my work, was the idea of creating worlds that exclude human beings. These worlds exist in themselves, they are parallel worlds in which no human is involved. So The Opera of Prehistoric Creatures was about resuscitating the sound of prehistoric animals that lived millions of years ago, and The Things? was about communicating with alien life, creatures that live very far, in space. So in the show at Import Projects, we tried to bridge great distances in time and space and bring these worlds back together, all colliding in one exhibition. You worked extensively with a variety of scientists and doctors, from palaeon-tologists and zoologists, to surgeons and ear and throat specialists for Horizons. What was the research process like? Did you have a concrete idea of what you wanted to accomplish or do you start blindly researching and wait for the concept to develop? MH: Yes, so I’m really thinking about these questions at the moment, because I’m working on a new project. Every time, it’s good reinventing the process of building a project. In my case, it’s really important because the process is always really part of the work—the process becomes an epic quest, an odyssey. So I’m also trying to reinvent it every time, but most of the time, I start with a few topics I’m interested in; I read in magazines, and then I start with my research, trying to find an interesting angle. It always starts with a lost or unknown world—a specific world or time or space or creature—that I want to revive, to reactivate, to reenact, or simply investigate. Basically, though, when I start contacting people to help me, I know exactly what I want to do. This is something I’m really interested in: working with a team of people with different types of expertise and really getting them to speculate with me into the world I am investigating. The Things? 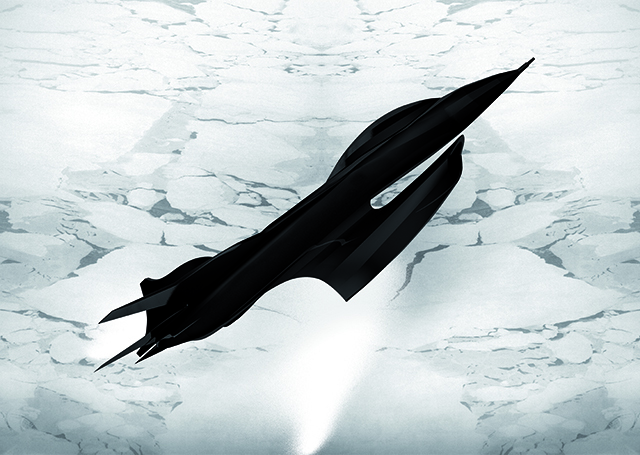 – A Trip to Europa, proposal for serenading outer space creatures with stunts, vibrations, chemistry, light, and live magic (2014). HEAD – Genève (Dylan Perrenoud). In one of your most recent exhibitions at DUVE, *Echoes*, you created a neon yellow, black mamba venom-painted space titled Black Mamba. You’ve said before that it was the contradictions of the venom—of things in general—that attracted you: its function as both a poison and an antidote. Tell me about this fascination and how playing with these contractions has informed your work. MH: I felt that until this show I was always choosing one point of focus for my projects—prehistoric creatures, or alien life, or sounds from the centre of the earth. I was setting up and solving an enigma, and would then show the results in the exhibition. But, with the show at DUVE, I was trying to take the next step. 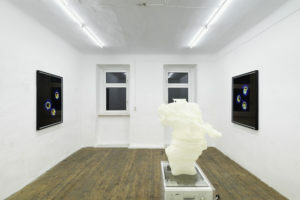 I started with one question again —the show was about eternal life and transitions from one life to another —and instead of proposing one solution, I tried to create various answers, in the form of sculptures or in the fresco and with the soundtrack, that could all together tackle the same idea but from different angles. To create enigmas instead of solving them. I wanted that, when one would enter the show, one would be confronted with different solutions to the same question, the enigma would then become unsolvable, the mystery filled with contradictions and paradoxes. 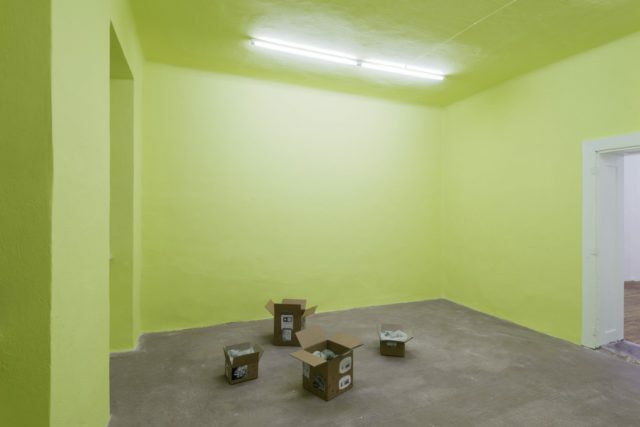 The show was about life and elixirs of life—there were creatures that were creating life and elixirs of life, there was a cobra that was creating its own antidote, and then there was Black Mamba venom covering the entire exhibition space. What I thought was interesting with the venom was the yellow color which made it fascinating and exhilarating, something that you’re drawn to but at the same time, it’s a deadly, terrifying substance. I also realised that every time one approaches life, one also approaches death—it’s never only one or the other. This is something I’d like to develop in my next shows. ‘Wadjet (King Cobra)’ from *Echoes* (2015). 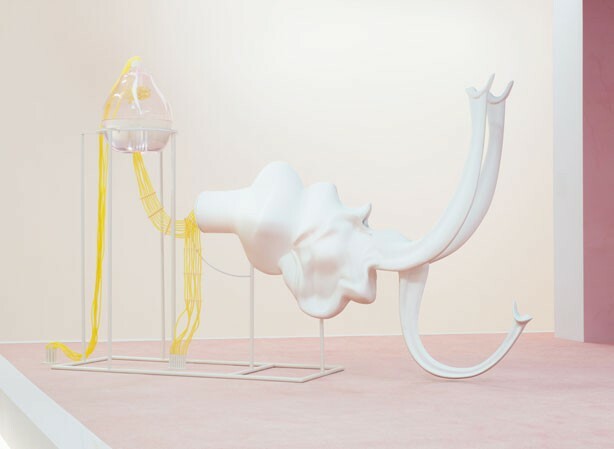 Image courtesy Marguerite Humeau & DUVE Berlin. I have became convinced that you’re a person that either has really intense dreams or watches really great weird movies—or both. I get the feeling like sci-fi and dystopian settings might be an inspiration for you. Are there any movies or books etc. that you keep returning to? MH: Yes, I found your question really funny! With The Opera of Prehistoric Creatures, for example, every time I talked about it, people were supposing that I’d been watching Jurassic Park. But actually I hadn’t watched it at the time at all. It’s tricky for me to combine work and reading, and watching films at the same time —I watch films, I’m a big fan of Cronenberg, Lynch, and also… Matthew Barney’s films, you know. I think maybe you can see that in the work. But I always feel uncomfortable watching films while working on a project. Reading and watching films— in my case, it only happens when I’m in between projects. Because when I’m working on a project, I don’t want to be influenced by anything else. Because when you watch a film, you have to really dive into a world that someone else has created. When I’m focusing on creating a world myself, I don’t want to be influenced. But I read mostly theory on communication technologies, “presence”, non-human worlds. It depends on the project but I would say my inspirations in general also involve a lot of documentaries about history or archeological stuff. I really like that. And I read a bit of sci-fi—recently I read Michel Houellebecq, The Possibility of an Island. MH: Yes. But what I read most is theory—one of my favourite books is Haunted Media by Jeffrey Sconce, and it’s one I’m always returning to. It’s about the idea presence and disembodiment in relationship to communication technologies. 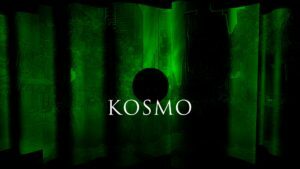 I’m also reading Quentin Meillassoux, Ray Brassier, and the Collapse books, and other thinkers related to this group. I found their work really exciting because they are, on a philosophical level, thinking about realities that could exist in themselves, without being thought / mediated by human beings. It’s actually exactly what I’m trying to do with my work. And to answer your initial question … I guess I have really intense dreams! ‘Walking Whale’ from The Opera of Prehistoric Creatures (2012). Image courtesy Felipe Ribon. One of the things that’s interesting about your work is the strong biological and historical leaning to your work, often rooted in some form of science; this is pretty starkly contrasted with a lot of ‘post-internet’ style art that nevertheless stays within the realm of the internet—social media, disembodiment, etc. Was that a conscious decision in any way, or is it just where your mind goes? MH: It was not a conscious decision when I started. My background is in design, so I was not really aware of the movements that were starting to emerge in the art world. I was going to art shows but I was not really part of that community. I didn’t really want to make a statement towards that, I was just doing my thing. What I wanted was to create works that would have a universal aura, trying to bridge different times, spaces, history, trying to confront different civilisations. I am trying to get to the essence of things and to see if there are patterns in the history of humanity or of the universe. And I think it’s essential that the work survives my time, that in twenty years it will still be relevant. But the internet is only a tool and a contemporary condition that we have to deal with. I would never consider it as a topic in itself. Opening credits of a film that has not been shot yet, The Things? 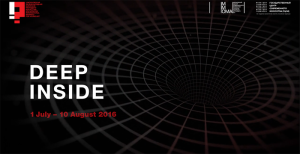 – A Trip to Europa (2013). Image courtesy Marguerite Humeau & Le Studio Humain. That’s kind of what I mean. For so much of art, that is the topic. It’s kind of imprisoned in that; it’s of that, it’s created in it, and it’s also its theme. MH: Yes, it wasn’t a conscious decision but now it’s becoming one to not do that kind of art. But I’m just following my own thing, really. 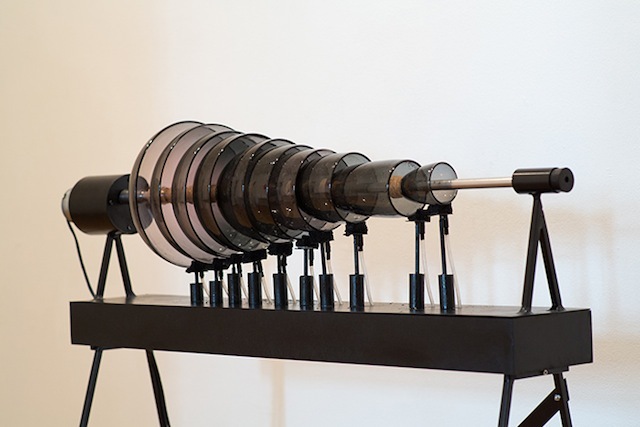 It’s important to live in my era, and I use a lot of technologies that didn’t exist ten or fifteen years ago—even for my ‘High Definition’ sculptures, for example, I’m using CNC machines—but at the same time, I want the concept and the ideas behind the work to be universal. Tell about your “Screams from Hell” project, which you’ve described as “bringing voices from the middle of the earth”. 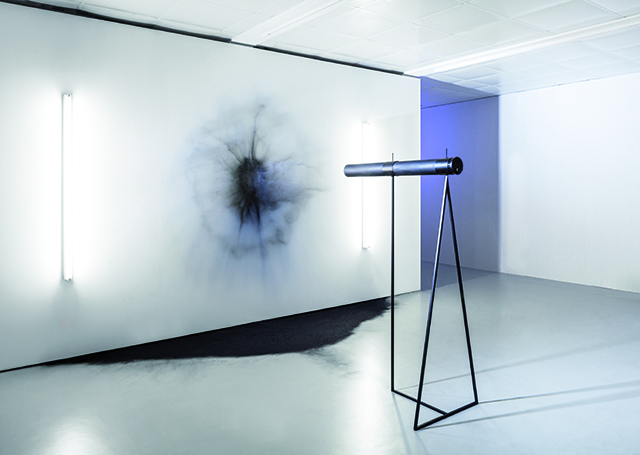 MH: It was a commission for the Rare Earth exhibition that happened in Vienna, at TBA21, last February. The curators had asked me to give a proposal and at the time, I had done my project on prehistoric creatures and alien life. And I thought that it could become a trilogy —and that it would be interesting to do a project about voices from the very deep past, from very deep in space, and now, from very deep in the ground. And then I found this article about this expedition that happened in Siberia in 1989. Scientists went there and wanted to explore the movement of tectonic plates, so they started to drill a huge borehole in the earth to investigate. At some point, they couldn’t drill anymore and removed the bore, and decided to lower down some recording equipment. They could only record seventeen seconds of sounds because the microphones all melted down there. And actually the seventeen seconds of sound all sound like screams… from hell. Like human screaming, and fire balls, and lava and rocks falling deep in the ground. And so I investigated a bit more and realised that the soundtrack was a hoax, although the expedition actually happened. And so I decided to make this story real —could it be possible to actually create sounds that could come from the rocks and the lava and the fire, crystals and stones? The feeling I always get from your work is one of the dissolve between paradise and hell—the quick shift from a silent, almost holy awe to a skin-crawling discomfort. I’m wondering if this is a common reaction—if this is one you feel yourself or are aiming to achieve. Marguerite Humeau is a French artist currently based in London. 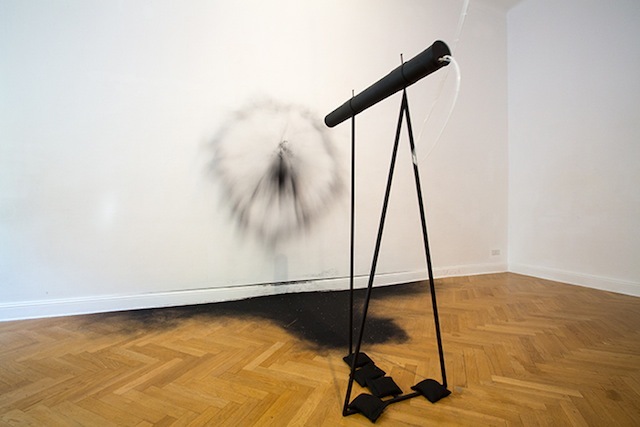 Her latest exhibition at DUVE in Berlin was titled *Echoes* and ran from April 30 to June 6, 2015. 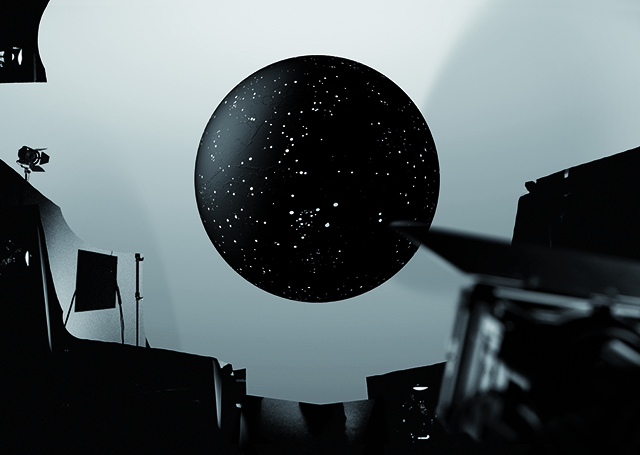 Header image: ‘Alien Signal (Black Powder)’, extract from director’s cut (2013). Image courtesy Marguerite Humeau & Le Studio Humain.